In geometry, rhombuses have four equal sides and both of opposite pairs of them are parallel. 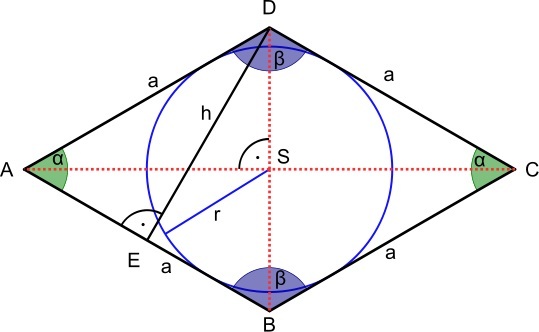 In plane Euclidean geometry, a rhombus (plural rhombi or rhombuses) is a simple (non-self-intersecting) quadrilateral whose four sides all have the same length. Another name is equilateral quadrilateral, since equilateral means that all of its sides are equal in length. The rhombus is often called a diamond, after the diamonds suit in playing cards which resembles the projection of an octahedral diamond, or a lozenge, though the former sometimes refers specifically to a rhombus with a 60° angle (see Polyiamond), and the latter sometimes refers specifically to a rhombus with a 45° angle. Every rhombus is a parallelogram and a kite. A rhombus with right angles is a square. The word "rhombus" comes from Greek ῥόμβος (rhombos), meaning something that spins, which derives from the verb ῥέμβω (rhembō), meaning "to turn round and round." The word was used both by Euclid and Archimedes, who used the term "solid rhombus" for two right circular cones sharing a common base. The surface we refer to as rhombus today is a cross section of this solid rhombus through the apex of each of the two cones.